Wil Anderson: They say in life you’ve got to know what you’re running to, or running from, and I am definitely a running from person. I grew up on Anderson Rd, which is named after my Grandfather. My Dad has lived on that road for 73 years, my brother is a farmer on that road. That’s what I was running from. People say that stand-up comedy is a hard job, they have clearly never milked a cow. No-one claps when you come to work as a farmer, you can’t drink while you do it, and you can’t send one of your mates out to warm up the cows first. Wil Anderson: It’s hard to take your eyes off Donald Trump’s Brewster’s Millions-style Presidential campaign. I think Gruen might have to have a What Would Donald Do? segment this year. Wil Anderson: Probably say something nasty about The Dark Knight Rises. I once read a horrible review of the movie, so I thought I would go online and if the person followed me I would block them. Unfortunately they didn’t follow me (bad taste in movies and comedy), so I went down and found everyone who followed me and retweeted the article and blocked them instead. I’m Blockman. 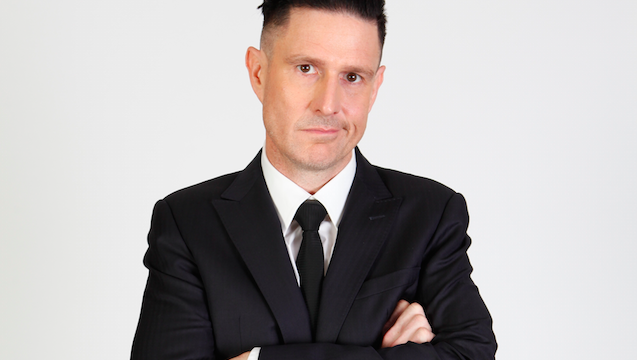 Wil Anderson: Hopefully I can make them laugh. That’s it. I am a comedian. A joker. Definitely not a role-model. If I am the answer, then you are asking the wrong questions. TBS: What advice would you give a 15 year old Wil Anderson? Wil Anderson: Learn to be comfortable with failure more quickly. If you are afraid to fail then you are not taking enough risks, and comfort is the enemy of comedy. Oh, and later in life you will want to shave off all your hair impulsively. Don’t do that. You have a terribly-shaped head it turns out. Wil Anderson: I have two podcasts (TOFOP and WILOSOPHY). In the last four years I have talked for over 500 hours on those podcasts. Believe me, there is nothing about me that no-one knows. Wil: Anderson: Pretentious words are the enemy of comedy. I love Russell Brand, but I wish he could express an idea without sounding like a thesaurus with a groovy haircut. My aim is to express complex ideas, but through simple language, which I guess is the dichotomy. Wil Anderson: When you work in commercial radio you get sent a lot of merch, which in my case went straight to the charity clothes bin. There are a lot of homeless in my area wearing Thirsty Merc t-shirts. Wil Anderson: What would you attempt if you knew you could not fail? TBS: What should fans of Gruen look forward to this September? Wil Anderson: Hopefully a show that looks at why we buy what we buy, and what that tells us about ourselves. I imagine Todd and Russel will disagree about some stuff.